Your pictures and notes at https://www.facebook.com/permalink.php?story_fbid=1193472554049336&id=575525955844002 are very helpful and encouraging. I’ve been reading up on epoxy and plywood construction techniques and it all seems quite achievable. I don’t want to take over your comments, so thought I’d email you my thoughts. What on earth do you want stays for (do you mean stays or shrouds)? Every time I look at the complexity and expense of a rigged boat, I shudder. Slow cooker recipes? I hope you have a pressure cooker. The food stays in even if the pot falls off and rolls across the floor. Make your window blanking plates of thick acrylic. They are as strong as plywood and you don’t end up in gloom which will lower your morale. If you fit a ‘brown stick’ to your Hebridean, you will have remote steering from the pram hood. Works like a charm. We had on on Badger and it was perfect for dodging ice. The only successful fishermen I know are those who like fishing. Much cheaper to put on a 5l container of lentils and a 5l container of brown rice. That’s 80 good meals for one person. (Add some curry powder and that’s 80 good-/tasting/meals for one person.) 1/4 cup rice + 1/4 cup lentils + 1 cup fresh water in the pressure cooker for 10 minutes. Your gas bottle locker can simply drain overboard via a small hole *or*into the cockpit. You don’t need fancy plumbing. Get rid of any through hull fittings that you can. I’d swop your marine toilet for a composting one. I’d save up for a new hatch. Houdini IMHO aren’t that great and a leaking hatch will spoil your entire voyage. You can buy a simple three-way switch to change from tricolour light to ‘steaming’ lights. 6mm chain should be more than enough for your wee ship. Definitely try and make yourself a yuloh. I recommend a digital barometer; it includes a clock. The downside is that most are bloody ugly. Feel free to dismiss them all if you want to!! Thanks Annie. You seem to have commented not emailed but don’t worry about that — say as much as you like. It might be helpful to other people. I have a spray hood (pram hood?) and it’s on the list for repair. It just needs it’s foggy window replaced. Bear in mind though that I’ll probably build a fixed pod that will replace it. 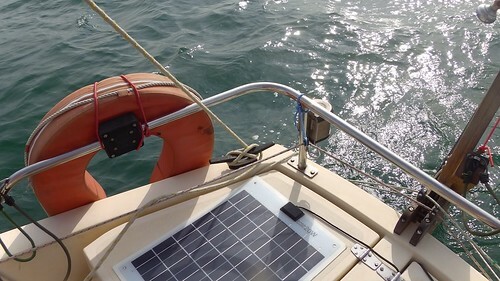 The split rig seems to rely on a tight luff on the main part of the panel, near the mast. The arrangement on Emmelène involved *pairs* of battens. I think I might be able to come up with something better with some thought. Might be important when I play with splits. I don’t want any standing shrouds. 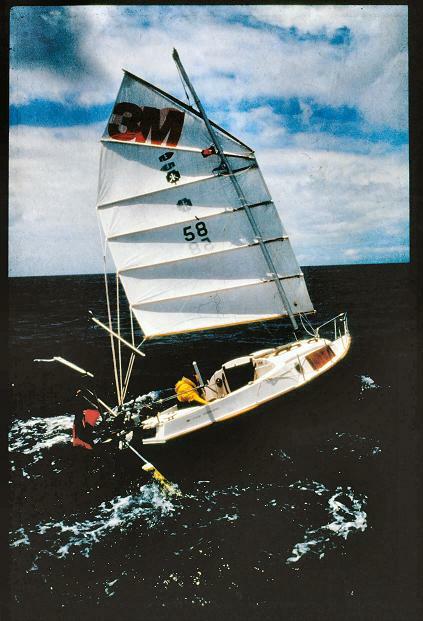 I was just thinking about running backstays or checkstays, to brace the mast on a run. I’ve experimented with this a bit by bringing the bitter end of the halyard back to a cleat. Dunno if it’s a good idea but I want to think about it more. I’m not thinking about extra rigging, but ways to use existing lines, or the spare halyard. I have a Mr D slow cooker which also retains food when thrown around, and keeps it hot too! It’s about the size of a pressure cooker but like a vacuum flask. I’m not sure what a brown stick is! Remote control for the Hebridean is tricky because the whole thing pivots. 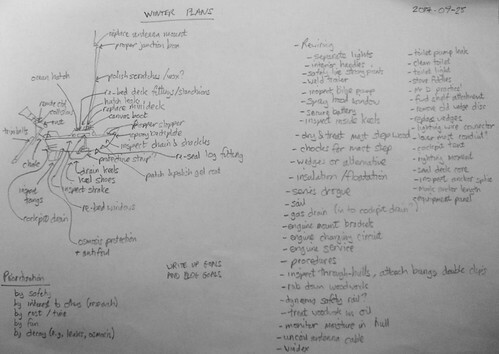 John Fleming is planning a kit with a worm gear. Beans and rice is a very solid staple! I’m interested in trying to fish but don’t know if I’ll keep it up. The gas bottle situation is slightly complicated and I’m trying to avoid a hole near the waterline. I’d need a diagram to explain. Basically my bottle is quite low. I already have a nice switch for the lights with an attractive knob too! But my ‘temporary’ panel needs to be retired. The hatch is indeed probably a lost cause. I don’t actually use the marine toilet very much but it’s popular with guests. I have my eye on composing things. All your points are gratefully received. At the very least they make me explain myself. I’m at a computer again, so here are a few links. Here’s a short article about running backstays. I don’t mean to imply they’re necessary — I’m just thinking about them as mast insurance. http://www.cruisingworld.com/how/backstays-future . Here’s how I attached a line with a rolling hitch to experiment with using the halyard as a stay. Here’s some of Emmelène’s rigging. On the right near the mast you can make out a plastic curtain ring that’s part of a downhaul for a pair of battens. 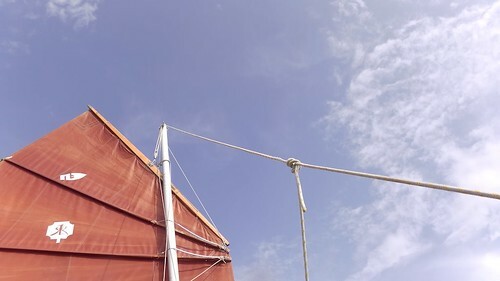 Similar downhauls keep the luff tight and close to the mast. 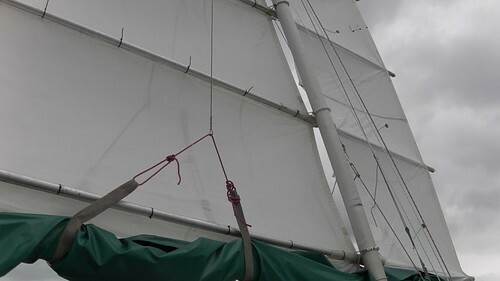 I’d have to quiz Slieve and Edward for the exact reasons this is important, but it makes sense when comparing it to the luff of a Bermudan mainsail. My rice is white, my lentils are green, but I’m making your recipe right now. A teaspoon of Marmite has added the missing salt and umami notes. I’ll try a combo with vegetable stock. I’ve been thinking about your acrylic window blanking. Looking at the picture above you can see that 3M Mariner had the large windows blanked from the outside for the trip. That could work well with the acrylic and allow removal and stowage. I wonder how I might attach them without leaving sticky-outy fittings. I ripped the toilet out and use a bucket – sailing 98% of the time alone anyways, with or without toilet Will turn this into a locker / stowage area where that comfortabel seat can be part of. I think we should be clear about motivation. The actual toilet and it’s plumbing takes up little space, requires little maintenance, and my heads compartment is already in use for storage; it’s my wet locker for a start. Removing it is a low priority. I’ve had many people talk about “holes in the boat” but actual personal accounts of dangerous skin fitting failure? Not one so far. National statistics were quoted in the YBW forums a while back showing that skin fittings are not much of a risk. The very use of the phrase “hole in the boat” suggests superstition. So I remain a skeptic / borderline heretic about this subject. But of course waiting to be proved wrong. Highten the companion way hatch to get out of the wheater / get shelter. Maybe put pramhood on top of hatch. Sail, engine + cushions have priority this winter.